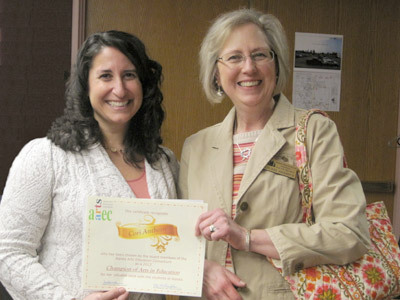 The Alaska Arts Education Consortium (AAEC) Champions of Arts in Education Award was created as a way to formally recognize and honor individuals or organizations from around the State of Alaska who “champion” the arts in education. The AAEC board of trustees considers this award to be a celebratory action, aimed at highlighting the positive impact of the arts on the lives of our children and youth. The efforts of these “champions” in teaching and supporting arts across the curriculum reflects the mission of AAEC, which is “to promote learning in and through the arts for all Alaska students”. AAEC believes that Champions of Arts in Education carry the torch for arts education through high-caliber instruction, arts support, and ongoing arts promotion. Besides being a wonderful, fun experience for students, the lasting impacts on these kids include becoming more effective communicators and responsible, contributing citizens. AAEC is an affiliation of 27 school districts, diverse organizations, and dedicated individuals committed to preparing and supporting Alaska’s educators so that they can teach the arts across the curriculum. This year there are three Champions of the Arts in Education, Cori Anthony of Fairbanks, Roy Stone of Palmer, and Jennifer Bradley of Bethel – from the Interior, Southcentral, and Western regions of Alaska, respectively. All three, through their teaching and support of the arts, have made the lives of their students better; have contributed to their communities, and the State of Alaska. The second Champion is Roy Stone of Palmer who is an art instructor at Colony Middle School. Described as a true artist, she introduces her students to a variety of media and is always willing to help other art programs, not only in the school, but the district. She teaches district courses, and one of her most recent projects was to produce and film the Mat-Su district’s opening day video that featured student and staff interviews in every single school. The Board of Alaska Arts Education Consortium salutes these Champions as well as the three member districts – Fairbanks, Mat-Su, and Lower Kuskokwim – that recognize the importance of arts in education, and acknowledge the valuable roles their staff play by nominating them for this honor as Champions of the Arts in Education.